If you find yourself in need of replacing an old RV refrigerator, or just want to have an up-to-date new one, look no further. 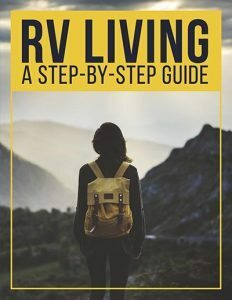 In this article, I’m going to tell you what you need to know about replacing your RV refrigerator, as well as some tips to keep your RV refrigerator working at it’s best! First things first, let’s get a general idea of how your RV fridge works. They are quite different from the refrigerator you have in your residential home. Your home refrigerator uses a compressor, an RV refrigerator does not have a compressor, nor does it use any moving parts to operate. This is called an absorption refrigerator. How does it work? In very basic terms, your absorption RV refrigerator works like this. It uses heat, and a combination of ammonia, hydrogen gas, and water. These chemicals react and go through various tubes, and the evaporation and condensation process of these chemicals are what cools the refrigerator. These are basic laws of physics. In the case of using shore power or a generator, the heat is produced by an element. When electricity is not available, an open flame from the L.P. gas is what is used to heat up the chemicals. Most modern refrigerators have this automatic feature: when there is no longer any AC electricity (shore power or generator power,) it will switch automatically over to using LP Gas to run. This way you do not have to remember to flip the switch, and your food stays constantly cold. 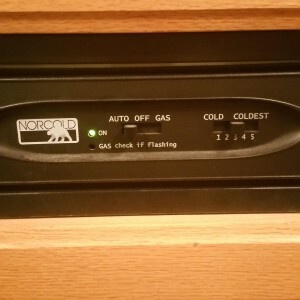 In the picture above, you can see how to set this refrigerator to run off LP Gas alone, or set it to auto– to run off electricity when available, but switch to gas when unavailable. Models are categorized into two types– 2-way and 3-way. A 2-way, which is the most popular type, runs off AC power and LP gas. A 3-way runs off AC Power, DC Power, and LP Gas. Size – You will need to measure the space you have available in your RV, to help you determine a model that will work in your space. If you are replacing an older Norcold, they have a great conversion chart on their website. You will need the model number of the old unit. You merely type it in, and it will give you the newer replacement’s model number. Please note though: Norcold does warn that some cabinet modifications may be necessary, as replacement dimensions are not an exact fit in all instances. Remember measure twice, cut once is always a golden rule to follow. Capacity – Just like household refrigerators, there may be a slight difference, in capacity, from one model to another, even though they fit relatively in the same space. Different options will affect the capacity size. Options – You may want to consider options you may or may not need that will affect not only the price, but available space you have. For instance, an ice maker may be a deal-breaker for someone, but unessential for another. 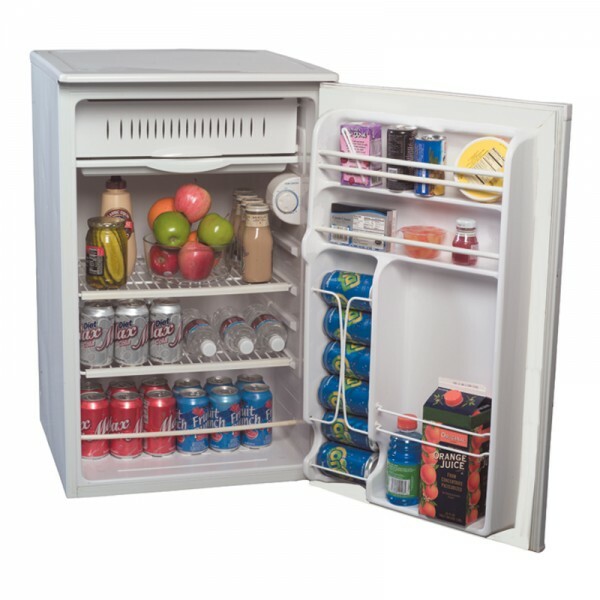 Tip – If you are running into the need of more refrigerator or even freezer space, but just don’t have the cabinet space available in your rig, you may want to consider adding a portable free standing refrigerator or freezer. This is a great option for when you are on the road more often, and it can help you maintain a budget, and store more food. 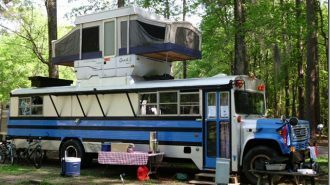 They really can save a lot of space, especially if you have a small RV. Some can be tucked away under a table or even tabletop. 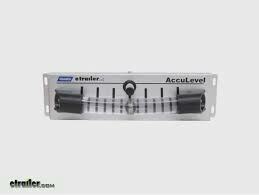 Most run on AC or DC power, making them great for camping whether inside or outside your camper. We found ourselves running into this all the time. There is not enough space, in our small RV refrigerator, for food and drinks. Instead of having an ice chest to constantly put ice in, our family has opted for adding a 4.3-cubic feet, portable refrigerator. It sits on a stand with a shelf, by our dining table, which is not really in the way, and it also provides an additional high-demand table top surface as well. We store it in the shower, while traveling, to allow for room to walk around when the slide is in. Price – Refrigerators are also quite an investment, with new models starting out around $1,100, they can easily reach over $3000 for larger units. If you are looking for ways to save, rather than pay retail prices, it is essential to shop around and compare prices. 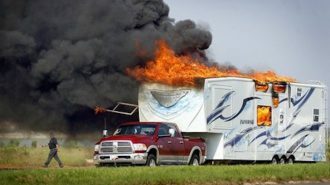 You could even talk to your RV dealer for closeout models, as well as refurbished ones. Once you have selected the best RV refrigerator for your needs, unless you have a dealer install it for you, the next step is the installation process. Removing your old one is actually the most difficult part of this project. Your refrigerator is screwed in, hardwired to the electrical system, and connected to an LP line. While there are a lot of tutorial videos on the removal and installation process, some provide good detail, but be aware, most are rated as moderately difficult, if you have to modify your cabinet. You must take great care any time you are dealing with an LP gas line, as well as electricity. If you are someone with a general knowledge of this type of project, then you can have the satisfaction of knowing you did it yourself, and save quite a bit of money in the process. 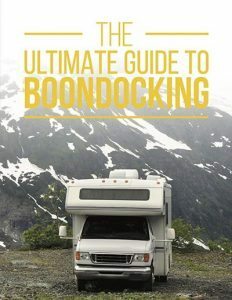 Some questions we all have asked at one time or another is, why can’t I use a normal residential unit in my RV?. While there are exceptions to the rule, and more and more hybrids are being manufactured to have the best of both worlds, true household refrigerators generally do not last in an RV, because they are made with soft metals, copper, brass, and aluminum. These were not designed, nor are they made, to withstand the vibrations going down the road. 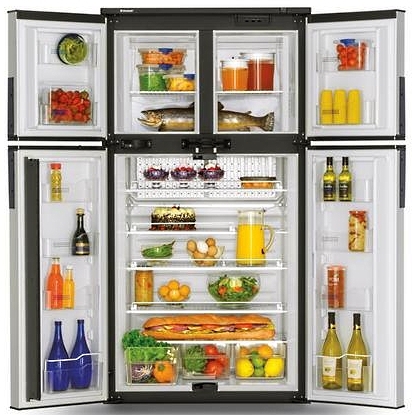 RV refrigerators are made of materials like steel. Steel is very durable, will last a long time, and will withstand the bumps in the road. 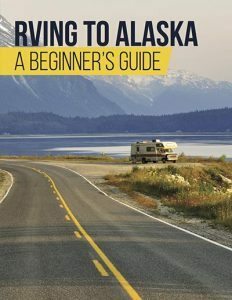 Remember, we also talked about the compressor and moving parts earlier, and how household refrigerators tend to not hold up as well, in the varied elements of the RV road life. Your refrigerator is a major appliance in your RV, and while you are able to do without one, for 90% of us, it is considered an essential component in our RVs. 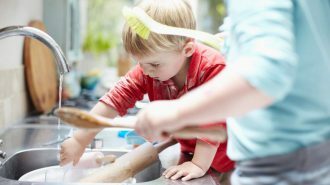 When the time comes, your replacement model should be made with careful consideration of your families needs. After seeing what size will fit, take some time to make a list of the options your family requires, and also the things you could do without. This will help you pinpoint a model that is just right for you and your budget. Shop and compare prices as they can greatly vary. With an investment this size, you will want to help your refrigerator operate in the most efficient and economical way as possible. Here are some tips to help you do this. Before your next trip, it is always a good idea to turn on your refrigerator the night before packing, to allow it to cool off to optimum temperature without food in it. Absorption refrigerators take longer to cool down, in some cases 6 hours or more. Overnight is perfect, as temperatures outside are lower, and it takes less energy to complete the cool-down process. It is best to put in items that are already cold in your refrigerator and already frozen foods in your freezer, to help with efficiency. Your refrigerator works twice as hard trying to cool off warm foods. You do not want to overload your refrigerator. Air must be able to pass through the shelves, and around the food in order to cool it. You should not put anything on the shelves to prevent the air from passing through either. 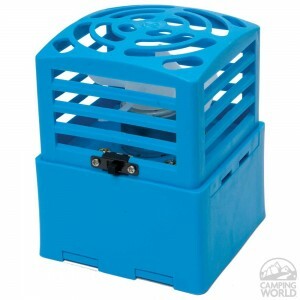 Purchasing a simple battery-operated RV refrigerator fan will not only decrease your cool down time by 50%, but it will also help temperatures remain more consistent. These little gems run on two “D cell” batteries for 30 days or more. They are a great long-term, money-saving option, with only around $18 for the initial investment. Keeping your refrigerator at the optimal temperature, by keeping door-openings to a minimum, will also help with efficiency. Refrigerators should be between 34 degrees and 36 degrees, but anything over 40 degrees subjects your food to spoilage. For your freezer, the optimal temperature is 0 degrees to 10 degrees. Use a simple thermometer to tell you if your unit is within these ranges. Monitor this, as with the change of seasons, your refrigerator may or may not need to work as hard. Freezers are not usually frost-free, and will need to be defrosted on occasion. 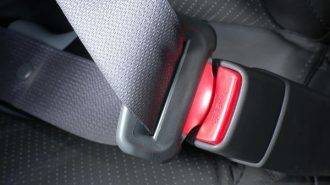 For a few weeks, this may not be a problem, but if you are out on the road for months at a time, it is something that will need to be done. You can simply plan to turn off your unit, to allow it to thaw naturally. If you are in more of a hurry, and want to speed up the process, put a pan of hot water in your freezer, and it will help the ice thaw. You should never use heat, a knife, or an ice pick to defrost your freezer, as it could damage your unit. Your refrigerator needs to be level to operate properly. Continuously using one, that’s not level, will damage the unit. Using a simple bubble level– placed on your refrigerator— will tell you how level your unit is. You should not be concerned while traveling as it will not hurt it. The liquids are constantly moving, and it is not sitting still for any length of time. A running refrigerator is far better than one that is not turned on. You will want to limit the amount of time that your fridge is not running. What happens when it is turned off? There are sediments in the liquid chemicals. and while it is running, these particles are floating, and constantly moving in the liquid, but when it’s turned off, they all fall to the bottom. This can cause clogs, if they sit for too long. With anything, the routine maintenance of checking the back and front vents for obstructions, is important. Even leaves and cobwebs will prohibit your unit from operating at its best. Take a look and clean around the connectors, if necessary. The outside temperature has an effect, as well, on its cooling efficiency. 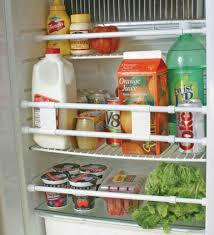 During the cooler temps, you can lower the refrigerator setting, as it does not have to work as hard to cool. At the same time, during the warmer periods you may need to raise the setting. 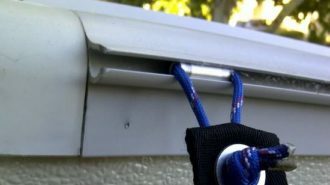 In extremely hot climates, try keeping your outside refrigerator vent in the shade, so it can get cooler air, and does not have to work as hard. 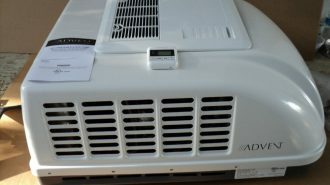 Also, a 12-volt fan can be installed, to help with moving the hot air away from the refrigerator. Make sure the doors close properly, and routinely check and clean the seals, to make sure air is not escaping. To prevent spills, all containers should be closed tightly, with their items secure, otherwise while traveling, you will more than likely open it to a big mess. 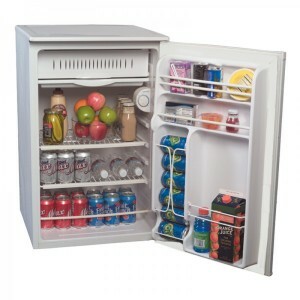 Also, expandable refrigerator bars are great to securely hold your items in place, so that your stuff does not come tumbling out, after you stop and open the fridge door. By following these tips, your new RV refrigerator will run more efficiently, and last you a long time– making your RVing experience a much more pleasant one.